Finish off your signature burger or fried fish sandwich with this Choice 32 oz. clear wide mouth squeeze bottle. This bottle's versatile, simple design is ideal for both back-of-house and front-of-house applications. While its open tip eliminates the need to cut off the top, its tight, no-leak cap prevents accidental spills and messes. Thanks to its innovative, wide mouth design, it's also easy to refill and clean after busy shifts at your restaurant, cafe, concession stand, or cafeteria. We love these. Make sure the lids stay with the 32oz bottles or they won’t fit correctly. The bigger the better so you can refill them less often. We use these squeeze bottles to hold flavorings for ice cream. They do well, but will sometimes clog when kept in the fridge or will get to pliable when heated in the fudge warmer. The bottle serves it purpose, but the small nozzles make it very difficult for any products that I tried it on. I had to cut the tips off in even to use it for ranch and mayonnaise. These are nice bottles. I have used 4 of the bottles for snow cone syrup and 2 bottles for funnel cake batter. I plan to use the other bottles for homemade hot fudge and caramel sauce. They are wonderful, so glad that I found them at Webstaurant! Can't get enough of these squeeze bottles, we use in house for everything from oil, dressings, hot and cols line, even keep a few for soap on the dish line. they are cheap enough to toss out and replace every few weeks. Great squeeze bottle with a nice precision tip. They tip is important since we use it for decorating. It gives a nice line and holds a lot, 32 ounces. Is it weird to love a bottle? These are the best, you can adjust the flow according to your needs by trimming the nozzle. The size of the bottle opening is great to be able to refil quickly as well and for cleaning. These bottles are a hit! They are definitely somewhat big but they are super inexpensive compared to the restaurant depot stores around the area and work the same or better because of the size. We ordered these for our elementary schools for condiments. they work great for when the kids are helping serve on the line. I would recommend. Perfect sized squeeze bottle for our sauces in our finish table. Caps holes are a bit too small for our use but they are cut easily. These bottles are great for dressings. We find that we need to cut a portion of the top off for most of our dressings, even the thinner ones. These squeeze bottles are a great value. We use in our commercial kitchen for several sauces and have been very impressed. Would recommend that any restaurant purchases. Fantastic squeeze bottles! The large 32 oz bottles are great for holding dressings or sauce. Good plastic that washes easy and doesn't hold stains. We cut the tops off so thicker dressings could squeeze easier. I was surprised on how thick these bottles are. I was expecting the real thin but they are very sturdy. I have no problem filling these with bbq sauce and keeping them in the freezer until I need them. Exactly what i expected when ordered. Great price and high quality product. Holds exactly 32 oz as stated. Would highly recommend to purchase over other brands. We use these DAILY! They are workhorses indeed. I won’t buy from anywhere else unless I was forced to. We wash and reuse over and over. I utilize the squeeze bottles for my sauces, and when I have caterings I used them for ranch bottles. It saves me money not using portion cups! These large squeeze bottles are a good value. They are durable, reliable, large, and inexpensive. They work for oils, liquids, and gels. If you need caps, those are available, as well, for a very modest price. Wide mouth is a MUST!!! So much easier to refill product into. Pouring is a breeze. One squeeze and it's done. Bottle is a great size. Easy to clean. We used these for snow cone syrup for an event. They worked really well and the narrow pour spout was nice to control the amount of syrup that came out. The fine point also made it easy to target where we wanted the syrup to go. My husband was afraid they would be too large to handle, but they really weren't. We will continue to use them. Great bottle! Flexible but not flimsy. Perfect for condiments on the cook line and hold up well to the commercial high heat dishwasher. Will be buying more. Much nicer than you would think. They are actually sturdy enough to be used for restaurants. Price can’t be beat. Have been using them for thick and thin sauces and they hold up. I like these but they are not universal, only the lids that come with them will fit those specific bottles. But they work as they are intended. Great product. The extra wide mouth makes it so easy to pour anything into them without making a mess. Very sturdy and easy to clean! The product is too good, it is commercial quality product, easy to clean with hands or dishwasher. I am using it for white sauce for my store, can have good quantity and I can use it for long time. Durable, Clean. These are huge and work great. Wide mouth is easy to fill and top screws on securely. These are great to keep filled with oil and allow pretty decent control of how much you want to squeeze out. These squeeze bottles are great, we use them for so many things! The tips can easily be cut if a wider tip is needed. I keep a dozen on hand to be switched out regularly, and they are used for salad dressings, garnishing sauces, and keeping smaller stashes of tabasco on hand (instead of a gallon jug) in a tiny kitchen that is also high-volume. Day label stickers stick easily to these and stay put. I only wish that I could buy replacement tips, as they can be easily lost or misplaced. These are some very big bottles! I use them for my sauces and for water and they hold enough for the whole event for the day. It makes it very convenient not having to refill endless bottles when the day gets busy. My only suggestion would be some texture on the bottle as it can get slick if you are working with grease. Outside that it is a great bottle for large use or high volume. These things are huge and efficient . They allow you to not worry about having to refill so much when you are busy , which is a life saver ....to say the least. The bottles are a clear container, easy to keep an eye on product levels. Soft sides make it easy to dispense product and the tips can be cut to the opening of your choice for a variety of dressing thicknesses. We love these squeeze bottles. We fill them with oil and they have not leaked on us yet. The lid fits nice and tight. Best bottles we have used so far. These wide mouth bottles are ideal for wing sauces, sour cream, and cheese wiz. We use all 3 in our restaurant, the tiny bottles with the tiny openings make filling a mess, and you are constantly emptying the bottle. With these larger bottles, filling them is easy and you don't run out of product as often. Tip: Thicker sauces in these bottles can be turned upside down when nearing the end of the bottle to make it easier to squeeze out. Also, the end nozzle can be cut to to customize the amount of product you want to spread, as well as make it easier to squeeze out thicker sauces. They are the perfect size to fill with homemade salsas. I wish they came in different colors. I will definitely order more in the future. The big lip on the bottle makes for easy refilling and the size is perfect for refilling most sauces only once per service. Great product. Just as with the choice 16 oz squeeze bottles, i didnt use them much and found the tips to be brittle which means a thin plastic, they did fulfill my ketchup needs for breakfast buffets. Happy with these bottles, they are a really good value for the product. Just be careful to make sure the product has cooled so it doesn't warp the bottle. Very good product for portioning and dispensing smooth non clumpy sauces such as ketchup and mustard. The nozzle is too small for thicker or clumpier sauces such as dressings so you may need to cut the nozzle or consider a different bottle. Cutting the nozzle to allow flow of thicker materials worked for us though. These bottles are excellent any restaurant could have many many uses for these bottles we use them for dressings and many other sauces . I recommend them for any restaurant . These larger squeeze bottles are perfect for keeping oil and water next to the flat top grill. Our cooks really appreciate how convenient it is to grab on the go and the amount of fluid they can hold helps with less stops for refills during a shift. There are so many great uses for these top quality squeeze bottles. Workers love the wide mouth. Wish we could purchase just the lids from Webstaurant because the bottle itself seems to last forever! These are great! I am using them to put my sauce and dressing in the cooking line. They are perfect size to hold enough sauce to use all day without change or refill too often. Plastic quality is great too. Big and huge size!!! great for the kithcen work, easy to squeeze, perfect for any dressing, oil or sauce, the size its great for large needs, really good!! These squeeze bottles are a must for commercial kitchens. I personally like to use them for cooking oils and vinaigrettes. Affordable and versatile, if you don't currently use these you should start! These are amazing squeeze bottles. The size is ideal for leaving in a common place for everyone to use. The seal is strong and they are very easy to clean. Horrible China made product. Customer service is even worse with a restock fee of 20% . Shop elsewhere buy American I found the same bottle made in the US for the same price. Thank you for the review Roy. We’re sorry this has not worked well for you. For an alternative that might better meet your needs, try this Tablecraft 32C 32 oz. Clear Squeeze Bottle - 12/Pack instead! Love these!!!!!! We use these for Catering events and BBQ events. They're perfect size for lots of sauce so you don't have to constantly fill them up. They hold up very well to a ton of abuse. My stickers adhere to them pretty well too. Excellent products , we bought a bunch of these bottles and we love them , easy to use and clean and the grip is good i highly recommend them . thinner than expected, does not handle heat well so do not store any near heat (aka ovens or stovetops or bunson burners). they hold product well and the clear-ish container makes it easy to see what is in each container. Have been using these bottles for about 3 years and so happy with them! Great quality. Easy to clean because they have a wide mouth. These are fantastic. The wide mouth makes it easy to fill with thicker sauces and the tips can easily be cut to adjust flow. I use dozens of them per day and have only had them break down on me by cracking after a few years of service. I can't complain about that. We loved these large squeeze bottles! We used these recently for our homemade fresh fruit snow-cone purees. The nozzles stayed clog free during our three day event. They are easy to clean and handle with one hand. These are ok, but given how big they are I would like them to be a heavier construction. If you put a heavy sauce (or fill it with a light sauce) the top may come off without warning and cause a heck of a mess during service or prep. Man these are a life saver. 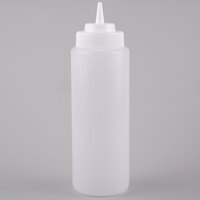 Great for ketchup, mustard, and barbecue sauce, this squeeze bottle is the perfect choice for self-serve applications. Love them. These are a must have in any professional kitchen. They clean easily, the top fits tightly, and they make plating a breeze. Can't imagine our kitchen without these. Best bottles I've bought so far. We use them for dressings and hot sauces. It thick enough to hold hot sauced without melting the bottle or burning your hand. Nice addition to my kitchen. Very good price for a nice squirt bottle. however, be warned that not all lids are the same among the different brands of squirt bottles so if your going to use on brand stick with it! I am very pleased with these Wide Mouth Squeeze Bottles. They were purchased for our daughter's BBQ Wedding Reception to hold various sauces. We also used them at her Bridal Shower to hold mayo and mustard for sandwiches. They are a nice big size and hold plenty for a large crowd of people. Bought these for dispensing our ice cream and chocolate mixes, The large 32oz container allows us to do a half batch in each one for quick measuring and mixing on our rolled ice machine. They are also used in our bakery for dispensing chocolate sauces and some thinner batters. Good quality and very durable. Easy to clean and does not stain with most sauces. Very good for pouring ketchup, mayonnaise, mustard, hot sauce, etc. We keep a few around the restaurant for customers to use without having to worry about spilling or spoilage. I love these bigger squeeze bottles for larger quantities of condiments and syrups. We used these or the multiple toppings at an ice cream sundae bar and they worked out great. We kept some toppings warm in a water bath, in a crockpot and the bottles held up great. Great for salad dressings made from scratch, as well. High quality and large enough to hold just about whatever you want to put in them. We have some for toppings and some for condiments. Load up on these every time I place an order. They are large and hold a lot of product. They hold up great over time. Self service condiments are easier to manage thanks to the large amount of space you get with each of these large squeeze bottles. The 32 ounce capacity allows me to focus on more important details of my taco tent instead of constantly refilling smaller squeeze bottles. Love these large 32 oz. Clean Wide Mouth Squeeze Bottles. They're a great price and the larger size is so imperative for busy services and product we go through more quickly. Every once in a while it is necessary to replace your squeeze bottles- the lids stop screwing on properly and they begin to take on the smell of whatever mixture you have had inside of them. These are inexpensive. These are really large bottles, they are good for storing large amounts of sauces and dressings. They are really handy to have in the kitchen..
Great quality and great price. We bought this for a candle project and it is exactly what we need. Will be buying more. The shipping is fast. I don't know what we would do without these! We use them all day, everyday for all the different sauces we have. Easy to clean and a great price! 32 oz container. These are good for pretty much any liquid. Get it from here. The price is good. Light weight too. We use it all the time. These are big bottles that hold a lot of product. They are easy to clean and work great for liquid ice cream toppings like chocolate and butterscotch sauce. I can't buy this size bottle locally so I buy from webstaurant, these are a great buy, we use for dressings and other sauces, they hold up nice. I got 2 packs of these and love them. We use them for our salad dressings and wing sauces and the quart size holds plenty without having to refill or get another bottle as often. We do have to snip the nozzle depending on what kind of sauce we have in a bottle so the larger chunks won't clog it, but that is easy enough to do. Top holds on tight without any slippage like some other bottles we have used. Great price, perfect size and good quality squeeze bottles. I'm going to load up on these every time I order from now on. I would absolutely recommend this product. We have a pizza store and we use these bottles in the prep area for salad dressings. The bottles hold a good amount of dressing and work well. Plus there dishwasher safe! Love these squeeze bottles. We use them for everything: sauces, clarified butter, you name it. These 32 oz ones are big enough to get my hand into and clean, which helps. Can't do that with the smaller ones. Perfect sized squeeze bottles. Not too big and not too small. We use them for a couple of different sauces that we use on our pizzas. For our restaurant, the 32 ounce size is great for holding sauces we use a lot of, such as vinaigrette's or aioli. Easy to use! I bought these squeeze botlles to use for various types of sauces. I like that they are clear, making it easy to see what sauce is in the container and how much is left. These are adequate squeeze bottles. They are lightweight and made of thin plastic. I like the wide mouth. I use them for everything from dressings to dry condiments as a shaker (i add holes to the top). The 32ox squeeze bottle is used at our grill. We just cut the top to allow more flow of olive oil. Nice thick bottle and its holding up well. Very reliable squeeze bottle. Good size. Easy to clean. Easy to store away. Wide opening easy for refilling. Tops screw on perfectly. See through makes it easy to see product level. These wide mouth squeeze bottles are a great value. Clear makes it easy to recognize what's inside. What more can be said? It does it's job well. Great product. We use this on all of our sauces. Helps with portion control as well. You can easily cut the top for a wider opening if you would like. We use these wide mouth squeeze bottles for salad dressings and burger sauces on our line. The wide mouth makes it easier to clean which is very important with sauces. The wide mouth on these bottles make it super easy to fill up without a funnel. It is nice that they have other lids that fit on these bottles perfect so its easy to change from one to the next depending on the application. Excellent quality and price. Great for BBQ sauce, and with the larger size, you don't have to fill as often. I definitely recommend to everyone. what a great squeeze bottle! We use these for all kinds of glazes and toppings in our bakery business. Easy to squeeze and can cut nozzle down for thicker toppings. The size of this bottle is great for a sub shop using a lot of dressing. Only problem was tall bottle for a smaller unit to keep. We did upgrade unit and fits nicely. Love the wide mouth for easier cleaning. Nice squeeze bottles at a great price. These are a must have in any commercial kitchen for sauces and dressings. Plus they last a long time. Great size for this bottle. The plastic seems study and the top is great when squeezing contents out. Will buy again, great price and great buy. These are the best quality squeeze bottles we have found and far less expensive than others we looked at. The wide mouth makes them much easier to fill and clean. These big 32 oz bottles ended up being the perfect size for us. They hold so much liquid and even if you use piping hot water in them (140 degrees), the bottles do not melt or deform or anything. For the price they can't be beat! I like these bottles and it is a good price, but the quality is not the best, but I will continue to buy them regardless. Great use for dressings and other liquids. Stores a lot more than your normal size if your doing more production. I plan to buy more in the future. The lids of these bottles tend to fall off when squeezing product out, ruining the dish. Our kitchen staff tells me never to buy this brand again. Thank you for your review! We're sorry to hear you have had problems with these bottles. We have addressed this issue with the manufacturer, and it is now resolved. Feel free to contact our Customer Solutions Team if you are ever unhappy with a purchase. The 32 oz wide mouth squeeze bottle is the only way to go when you need a lot of product in a bottle. With the wide mouth, very easy to fill. These bottles are great to have on hand to use for various sauces from BBQ to Cream based sauces. We have the larger (32 OZ) and the smaller (16 OZ) sizes. They are durable and easy clean, feel like you can't have enough. We use these bottles for condiments and shaved ice syrups. They are great quality and do not leak! I can't seem to get enough so I am ordering more! We use these for BBQ sauce, ketchup, mustard, salad dressing and pureed fruit for making different flavored lemon shakeups. You can easily trim the tip down if you need a bigger opening for thicker material. Great product at a very reasonable price!! It is great for our sauces that we use on our steaks, hamburgers and fish. Will order again when the need arises. These bottles are so handy for different items in the kitchen (and elsehere, i.e., the garage. My Husband uses them for some pool chemicals and lawnmower liquids. No. Not gas.) They are great for mayonnaise, mustards, ketchups, oils, etc. One Son manages to sling mayo from the jar to his food and the squeeze bottle has proved invaluable. Only goes where he needs it with no clean-up! My favorite use is with oils. No-drip when you just want a squirt. We ordered six to start and will probably order more for stocking stuffers for the kids. Thank you! Price is right too. Very inexpensive for such a useful item. The wide mouth squeeze bottle is exactly as described and fits into our set up. The hold a full quart which is very useful. The construction is sturdy enough for our purposes. There is no issue with leaking out of the sides. Perfect for our sauces! The wide mouth allows for easier and less messy filling. Tips are a bit small, so we just cut them a bit. Buy more of these than you think you'll need. Why? Because you'll find endless uses for them. Dressings, oil, vinegar, water (! ), and pretty much anything else go with ease into this wide mouthed containers. At home, I keep my olive oil, canola oil, sesame oil, cider vinegar, wine vinegar, and rice vinegar in these containers, and find it very easy to hit my food with a burst of flavour within a few seconds. At work, we use these bottles for all of our sauces (including very thick, creamy mayo), as well as canola oil, olive oil, and water (for deglazing pans when necessary). They're extremely handy, and you'll wish you had some spares for other tasks. we bought the squeeze bottles for salt and pepper and also our salad dressing. it can keep our working area neat and organized. no mess! The 32 oz. Clear Wide Mouth Squeeze Bottle 6 / Pack is very sturdy and stain resistant. We use them for various things in the kitchen and on the floor. These bottles hold a lot of whatever you'd like to use them for. They stain easily, but I don't think I will ever meet a bottle that will not stain from our homemade bbq sauce. Great price! We use several of these for dispensing different types of oil into fry pans. The lids stay on even with using firm pressure to squeeze the oil out. Great squeeze bottles for hot or cold sauces!!! Great value pack/ price!! Wide mouth top makes filling the bottles a breeze, you just have to turn them over and pour your dressing, etc. right in them! Great for oil! We use these large bottles for everything from dressings, olive oils, garlic sauces, bbq sauce, wing sauces and more. They clean up well and last a long time.